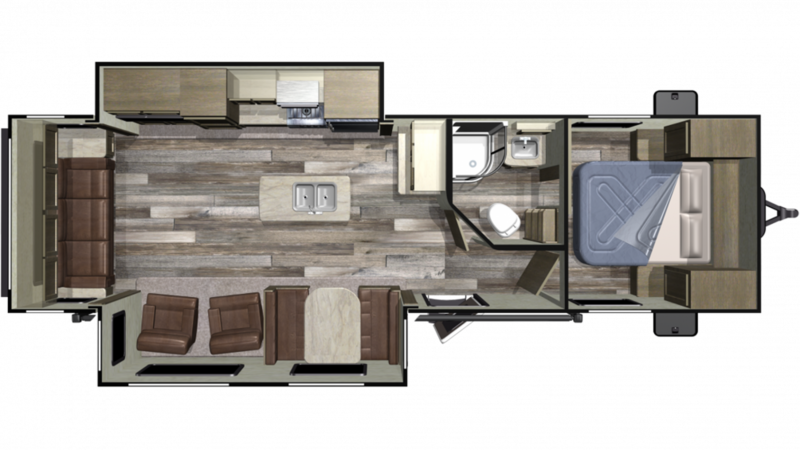 Visit Hamiltons RV to find the 2019 Starcraft Autumn Ridge Outfitter 27RLI and other quality models! This reliable Travel Trailer is built for long trips, various climates, and to give you years of fun! See this RV for yourself at 1580 Tittabawassee Saginaw Michigan 48604, or call us at 989-752-6262 to learn more! You'll soon see why we're regarded throughout Saginaw as the best Michigan RV dealer in town! Keep cool outside under the shade of the 20' 0" awning! Tow this RV with ease, with its hitch weight of 1085 lbs. and GVWR of 8995 lbs! This roomy Travel Trailer not only has great living space, but it also has great sleeping space too, with enough comfy furniture for up to 5 people to sleep well! The master bedroom features a Queen bed! It'll be sweet dreams every night in comfort and privacy! Included in this Travel Trailer is a fully furnished kitchen with all modern appliances, including a 3 burner range cooktop and a roomy 6.00 cu. ft. refrigerator to store all your fresh foods and cold beverages! You'll have enough refreshing, clean water for your family's needs with the massive 48 gallon freshwater tank! Nothing feels more like home than a spacious, private bathroom where you can wash up, shave, or take a leisurely shower, morning, noon, or night. That's why this RV comes with a beautiful, roomy bathroom, complete with a modern shower and a sleek Foot Flush toilet! This RV also has a 40 gallon gray water tank and a 32 gallon black water tank. Comfort, convenience, and privacy - just like home!